A woman in her 30s was killed Monday evening after a shooting at a Hamilton home. Police have made an arrest in the case. Police have arrested and charged a 41-year-old man with second-degree murder after a shooting Monday that left a Hamilton woman, a mother of two girls, dead. Natasha Thompson, 36, died Monday evening after a shooting at a Hamilton townhouse complex. Police received a 911 call just after 5 p.m. about shots fired at a home on Lang Street. They say they found Thompson suffering from gunshot wounds. Police say she did not live at the two-storey home but a neighbour there said she saw the victim often. She was pronounced dead on the way to the hospital. On Tuesday, police arrested Mark Joseph Champagne, a 41-year-old man, in connection with the shooting. He turned himself in to Toronto police around 4:30 a.m.
Hamilton Police detective Peter Thom said that eye-witnesses reported that Champagne was Thompson's boyfriend. Thom said "neighbours heard a verbal argument... it continued outside where, the information is, he shot her multiple times." Thom said Thompson had a 16-year-old daughter and an 11-year-old daughter. Police said the weapon used in the murder has not been recovered. They are expected to answer questions from reporters later Tuesday morning. Neighbour Carla Parker said she saw the victim just minutes before police say the shots were fired. "Me and my boyfriend were going out to dinner," Parker said. "She was sitting on her front porch having a smoke with her door open, with music. And, she didn't really look like she was in trouble or anything." Parker said the victim had two daughters and one of them would play with her child. Parker said that in the almost six years she has lived at her Lang Street home "This is the first bad thing that has happened here. But this neighbourhood is just getting worse and worse... You took someone's life. Now they have no mother." Police say the victim and shooter are believed to have known each other. Another neighbour, Ellen Campbell, lives around the corner from where the shooting took place. Campbell said Thompson "was a nice lady. We just hung out and had fun... She had children, so, it's really not good what happened." Campbell said her own children have become worried about living in the neighbourhood. "This morning when they found out what happened, they don't want to live here anymore," Campbell said. 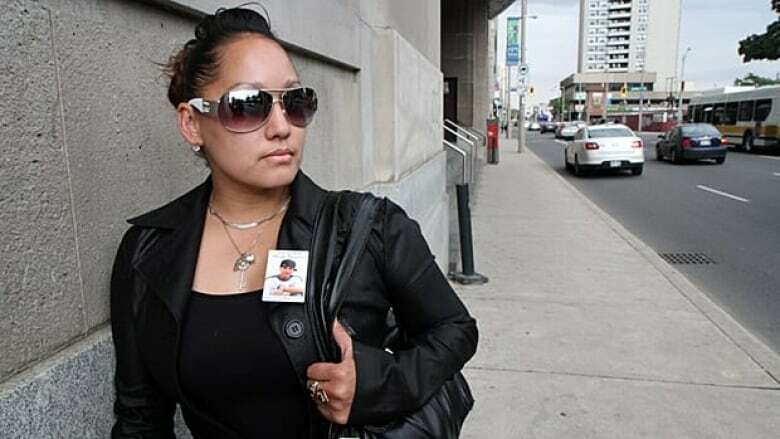 Thompson shared two children with Phonesay Chanthachack, who was shot and killed by Hamilton police in February 2012 when he tried to leave a driveway in a stolen van at 15 Albright Rd. An inquest was held into the shooting death. The officer who shot Chanthachack was one of four Hamilton Police Service officers positioned around an east-end parking lot on Feb. 13, 2012, watching a stolen van. Thompson was present during the inquest.